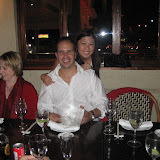 A few days before my Germany trip Cyril and Vanessa invited for Cyril's 30th birthday into the Saigon in Rivonia. Celebrations included some delicious Thai food, a thai massage (see pictures), my introduction to the South African "suitcase" (ein leckerer Kurzer) and meeting many nice people. Thanks guys, it is always a pleasure enjoying your two's company!